La Roche Posay Effaclar Duo Plus Review: Will This Be Helpful To You? La Roche-Posay Effaclar Duo Dual Action Acne Treatment is marketed is a fast-acting, quick-absorbing treatment, which is meant to fight acne and breakouts by exfoliating away dead skin cells. La Roche-Posay Effaclar Duo Dual Action Acne Treatment contains benzoyl peroxide, which is a well-researched, acne treatment. Combined with Micro-exfoliating LHA, this product can penetrate deeply into the skin to clear away dull, dead skin cells. Although most acne treatments are extremely irritating, La Roche-Posay claims that this product is non-drying. For best results, use La Roche-Posay Effaclar Duo Dual Action Acne Treatment as a daily acne treatment. Gently apply a thin layer of this spot treatment during your morning and night skincare routine to your trouble spots. Although this product claims to be non-drying, it’s always best to do a spot test to determine whether your skin can handle the ingredients. 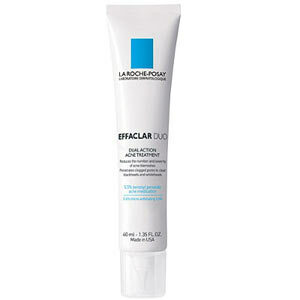 La Roche-Posay Effaclar Duo Dual Action Acne Treatment retails for $36.95 per 1.35 oz. of product on several well-known beauty retailer websites. Benzoyl Peroxide (5.5%): This ingredient is intended to address whiteheads and blackheads. Salicylic Acid: This ingredient promotes cell turnover and prevents clogged pores. Micro-Exfoliating LHA: This ingredient clears away dead skin cells and prevents clogged pores. It also allows other products to deeply penetrate the skin. This acne treatment is oil-free and non-drying. This product treats stubborn blackheads and whiteheads. This acne treatment contains benzoyl peroxide as its active ingredient, which is a well-known combatant against acne. This product is a bit pricey for a topical acne treatment. Several customers claim in their reviews that this product caused their breakouts to worsen. This treatment can be extremely drying for those with sensitive skin. Breakouts can be embarrassing and frustrating. It’s difficult to feel confident, especially when your breakouts are bad enough that you can’t cover them up with pimples. La Roche-Posay Effaclar Duo Dual Action Acne Treatment claims it can help with your pesky breakouts, without causing irritation. Although this product may sound like the solution to your acne problems, there are several issues we’d like to raise before you consider purchasing. A quick glance at customer reviews indicates that this product certainly can cause irritation, despite its claims. Several customers claim this product really didn’t do anything to address the look of their acne at all. Some customers even claim this product turned their small breakouts into full-blown acne. If you do consider purchasing this product, be sure to do a spot test to make sure your skin can handle these strong ingredients. La Roche-Posay Effaclar Duo Dual Action Acne Treatment is available on several well-known beauty retailer sites. One in particular has a very reasonable return policy. If for any reason you are not happy with your purchase, simply return the product within 30 days with the original receipt for a full money back guarantee. After 30 days, you may return this product for store credit.